The central nervous system produces motor responses to maintain standing balance through complex processing and integration of multiple signals regarding the position and motion of the body in space. Activation of trunk, leg and foot muscles contribute to whole-body balance control to varying degrees. Even though the feet provide an excellent source of sensory information, it is uncertain whether foot muscles play an active functional role in maintaining quiet standing balance; or whether the activity of these muscles is simply a by-product of preserving rigidity of the feet for the plantar flexors to produce postural responses to keep the body upright. Electrical vestibular stimulation (EVS) can be used to evoke whole-body balance responses that arise from the summation of all muscles involved in the compensatory response. The presence of vestibular-evoked balance responses can elucidate the specific muscle’s role during standing. Thus, the purpose of our study was to determine whether foot muscles – specifically, the abductor hallucis (AH) and abductor digiti minimi (ADM) – displayed postural responses driven by vestibular stimulation during quiet standing. 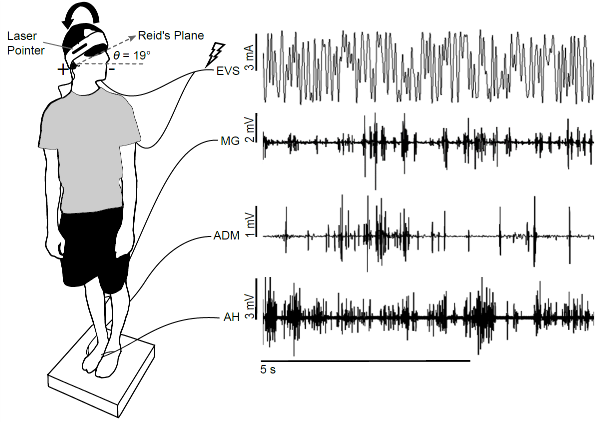 Seven healthy, young participants were exposed to a continuous, random EVS signal during quiet standing (Figure below). We assessed postural responses as variations in anterior-posterior forces under the feet, and AH, ADM, and medial gastrocnemius muscle activity using surface electromyography. We characterised the relationships between the EVS input and subsequent motor output in both time and frequency domains via multivariate Fourier analyses. We found that vestibular-evoked balance responses were present in anterior-posterior forces and in all muscles. These responses were modified similarly via head orientation (affecting the direction of EVS-evoked balance responses) and removal of vision (affecting the weighting of sensory information), which is characteristic of a postural adjustment driven by vestibular stimulation. The current findings emphasize that foot muscles provide an active role in balance control during standing. Our results indicate that a complete model of the sensorimotor control of quiet standing should include foot muscles. Future research should focus on examining whether decrements within foot muscles lead to impairments in standing, and whether rehabilitative strategies involving these muscles can improve postural control in those with standing balance problems. Wallace JW, Rasman BG, Dalton BH. Vestibular-evoked responses indicate a functional role for intrinsic foot muscles during standing balance. Neurosci 377: 150-160, 2018. 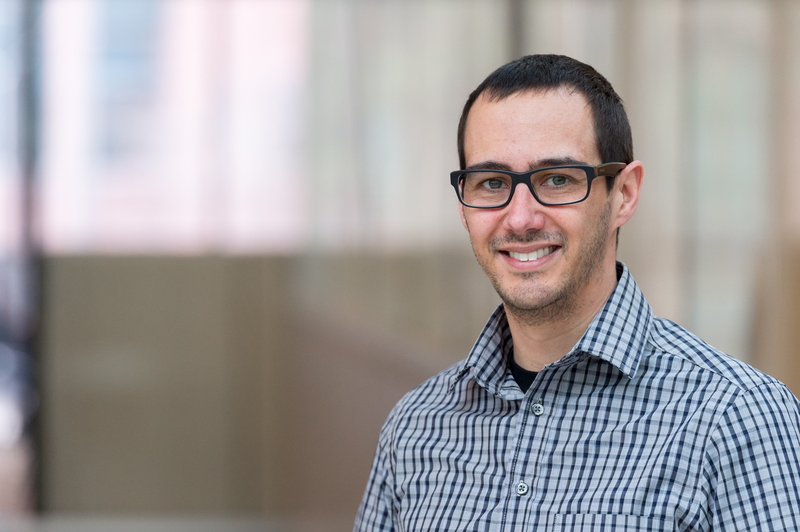 Dr. Dalton completed his undergraduate and MSc work at Memorial University of Newfoundland and a PhD in Kinesiology with a focus on neuromuscular physiology and adult aging in the Canadian Centre for Activity and Aging at the University of Western Ontario. He completed a postdoctoral fellowship at the University of British Columbia in sensorimotor physiology. PreviousYour mom was right, variety is the spice of life! 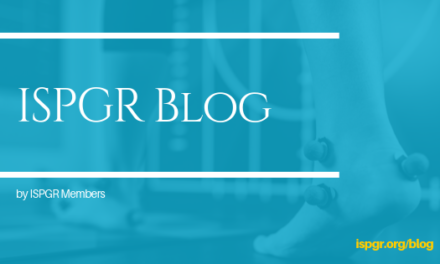 Knee ligament reconstruction – a persistent threat to balance ability long after surgical repair? Your mom was right, variety is the spice of life! Ready to be perturbed? Prior knowledge about timing of upcoming perturbation shortens muscle reflex latency.